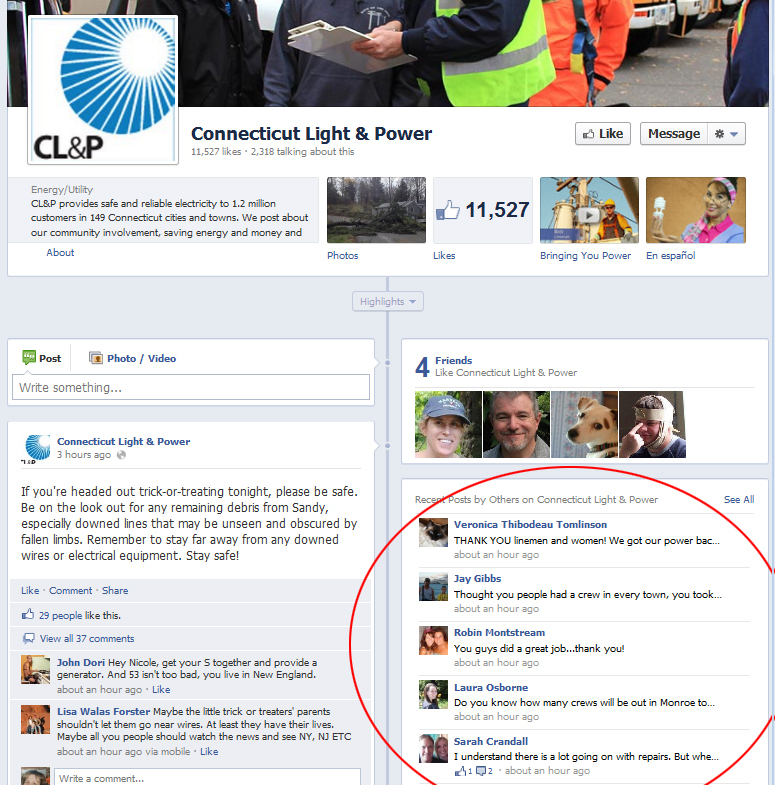 If you live in the state of Connecticut you electric needs are services by one of the following two regional utility companies: Connecticut Light and Power (CL&P) delivering electricity to 1.2 million CT customers and United Illuminating (UI), a smaller utility provider, responsible for densely populated Greater New Haven and Bridgeport areas with 325K customers. 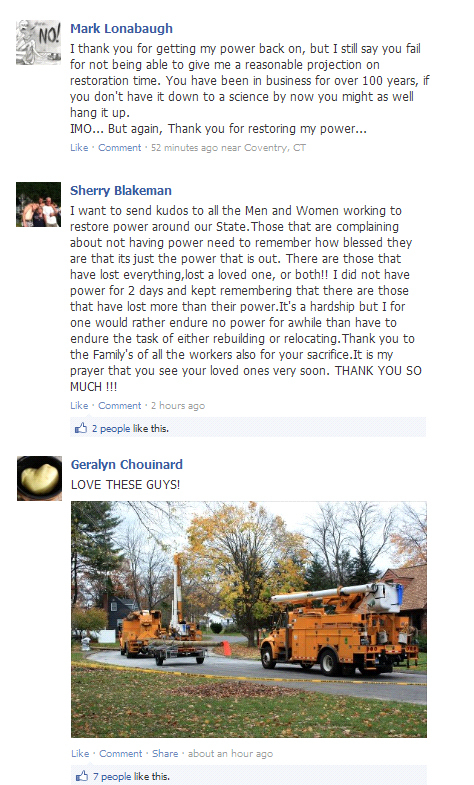 During the Snow Storm in October of 2011 both utility companies were widely criticized for delays in restoring power to Connecticut residents. With significant push from CT state government both utilities promised to work on improving their power outage response plans including customer communications during power outages. In fact, representatives of both companies stressed their efforts in this area during multiple pre-Hurricane public appearances including Gov. Malloy’s press conference. Curious about how both companies have been utilizing social media for crisis communication during hurricane #Sandy I decided to take a careful look at their efforts in key social media channels. 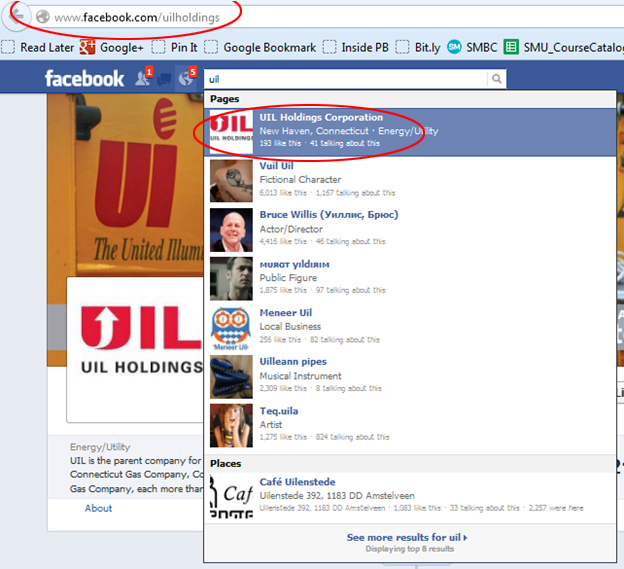 Both CL&P and UI use their website’s home pages to prominently display links to their key social media channels. 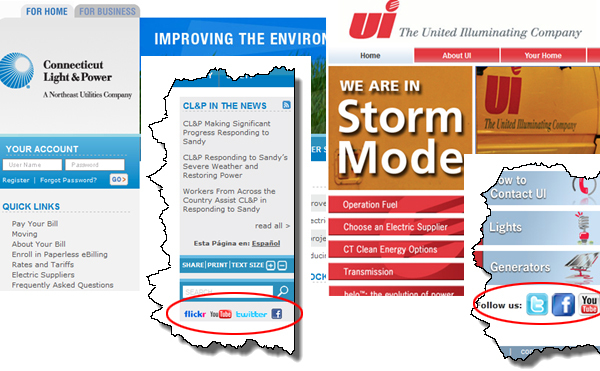 While CL&P continues to carry links to their Social Media channels on their Storm Center page UI’s storm center page does not, making it much harder for customers in distress to find ways to communicate with the company in social media. Strike one for UI! 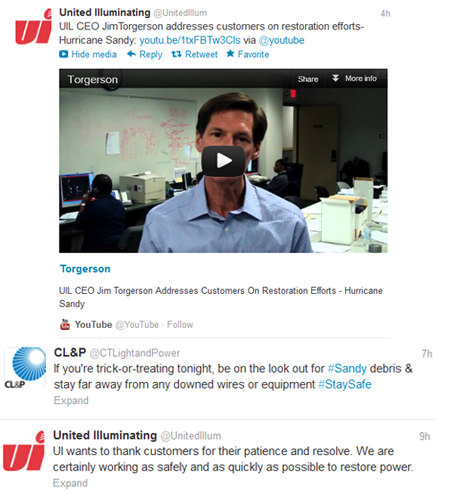 Both CL&P (@CTLightandPower ) and UI (@UnitedIllum ) have been utilizing twitter very actively (tweeting every 1-3 hours) and providing timely customer updates, tips for staying safe in the dark and most importantly sympathizing with their customers. The difference between @CTLightandPower and @UnitedIllum is quite evident when it comes to utilizing Twitter for two-way conversations. Here is the latest twitter steam coming from CL&P’s twitter account. Notice something? Yes, it is full of tweets in response to questions and comments coming from other Twitter users. Not only is CL&P actively responding to customer tweets no matter how angry those tweets might be, CL&P is also recognizing their advocates who are spreading important news and good will on behalf of CL&P. What about @UnitedIllum? – you ask. I did searched their Twitter stream all the way back to pre-hurricane days and found plenty of tweets directed at @UnitedIllum, none of which have been addressed by UI. Not even a tweet coming from the Mayor of Bridgeport himself! Ok, that’s enough for strike number 2. I decided to begin my Facebook assessment by looking at how easy it is to find both companies’ fan pages using Facebook search. CL&P Facebook page has been set up using the exact same name CL&P uses outside of social media and it is easy to find. All I needed to do was to type Connecticut L… in Facebook’s search form for it to appear as number one in search results. 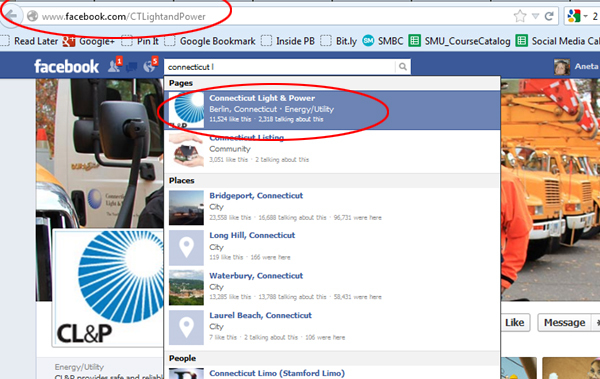 Their Facebook vanity URL is also easy to remember: http://facebook.com/CTLightandPower. Let’s look at UI now. First thing I did was to type in the word “United Illuminating” in Facebook’s search field to discover that at the bottom of the search results there is a page wit UI’s logo. To my surprise the page turned out to be a disappointing miss. Instead of a brand-controlled fan page it was a link to a static organization page displaying UI’s description on Wikipedia. Not quite what I had in mind. As it turns out, unless you know what to type in Facebook’s search form you are going to have a really hard time finding UI’s Facebook fan page using the company’s name. 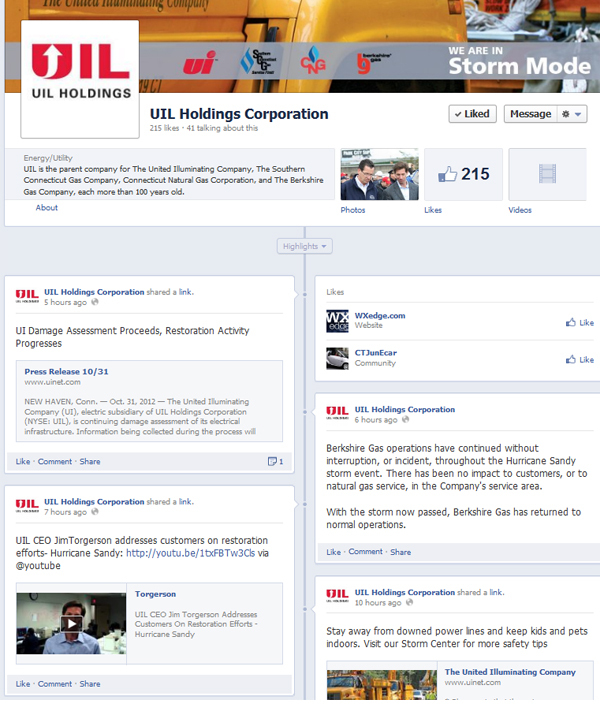 Instead the page is available under “UILholding” name (UI’s parent company’s name). Not sure how a customer is supposed to know that. 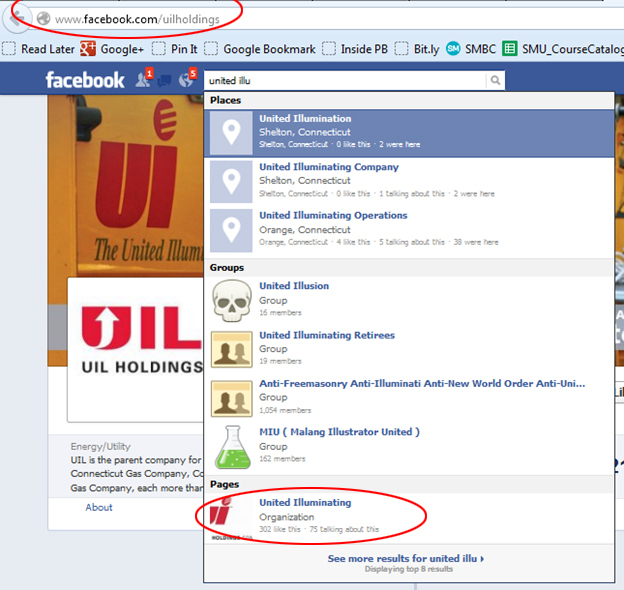 Now that we finally found the United Illuminating page let’s take a look at the two company fan pages side by side. 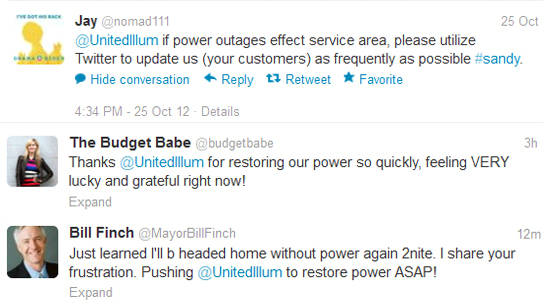 Both of them are doing a good job updating customers with their power restoration efforts. Kudos. The difference becomes quite evident though once we discover how different the two company’s approaches are with respect to dealing with customer posts and comments. CL&P is respecting their fan’s posts by displaying them in the “Recent Post by Others” area at the top of the page. This area includes both positive and negative comments. Despite what you might have expected I did count 14 positive and only 6 negative posts int he first 20 mentions in this area. 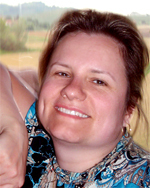 CL&P understands that there is no way you can hide away from customers in social media. Best to address their concerns and thank them for their positive comments in the open. What did UIL decide to do? Well, they decided to hide the “Recent Posts by Others” panel all together effectively removing any posts other than their own from appearing on their Fan page. In addition, UI has chosen to default all of their fans’ comments to “hidden” and review each comment before it’s published. Instead of dealing with their fans’ opinions in a transparent way and building trust they opted for opacity in a way they chose which comment gets displayed and which one remains hidden from public view. That’s definitely strike 3 in my book. I understand that United Illuminating may be a much smaller company with fewer resources, but for a company whose VP touts communication as one of their key improvement after 2011 #Snowtober they still have a long way to go before understanding and harnessing the true power of social media for crisis communications. Time to take it to the next level guys. 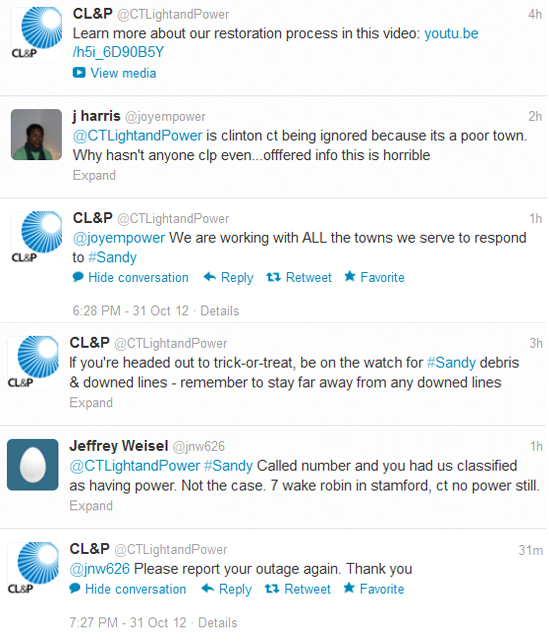 On the other hand I am quite impressed by CL&P’s crisis response in social media. Congrats guys and keep it up! And yes, I am planning on observing and comparing both utilities during the next storm! Thanks for the interesting assessment. This is a great comparison of 2 companies and has very interesting applications for all companies. Every company must be ready for crisis response and it looks like most companies have something yet to learn as to how best to handle crisis response in the age of social media.